Scotland is rightly famous for it’s castles. Here is our top guide to the ones you can stay in. This stunning baronial mansion house was built in the late 19th Century. It sits amid evergreen trees overlooking the sparkling blue waters of the nearby loch, and is now an award winning luxury hotel welcoming guests to enjoy its magnificent splendours. Albert and Michel Roux Jr run the fine dining restaurant at Inverlochy Castle Hotel. The culinary experience on offer is certainly one to be savoured. Each of the 17 bedrooms and suites has its own distinctive charm and character and fine Egyptian cotton bedding. Guests could also choose to stay in the Gate Lodge, which has lovely views of nearby Ben Nevis. Inverlochy was voted Scotland's Luxury Hotel of the Year in 2017 and was voted Best Castle Hotel at the Scottish Hotel Awards in 2018. This hotel is a perfect base for those wishing to climb Scotland's highest peak, or other nearby mountains and is just three miles from the town of Fort William, a hub for the western Highands. From there, you can take the famous West Coast Railway to pass over Glenfinnan Viaduct (famously featured in the Harry Potter films). There are also plenty of hikes and gentle walks to enjoy in the stunning surrounding area. Those who like a wee dram may wish to visit nearby Ben Nevis Distillery, while during the winter, nearby Nevis Range is a Mecca for winter sports enthusiasts. Another baronial mansion, this turreted castle stands at the head of a grand estate of 6,500 acres in the heart of Glenshee. It has a long and proud history that stretches all the way back to 1510 and is an ideal escape location for those who value peace and serenity. Breathtaking mountain views all around, lush glens and little rivers just steps away... who wouldn't want a taste of this relaxing haven. The hotel has a golf course for those who love to hit a few holes, and each of the 17 bedrooms and the two bedroom suite offers sophistication and individual charm, looking out onto the mountains, golf course or verdant lawns. Each of the bedrooms is named after a family or clan which was involved in the history of the castle over the last 500 years. Glenshee is another of Scotland's main skiing and winter sports areas, and also offers plenty of delightful walks and hikes throughout the year. Those of a mystical bent may like to know that the glen is named for the sidhe, or fairies, who, it is said, lived here until, in the age of industrialisation, they were scared away by the whistles of the new steam trains. This castle is located right in the centre of the village of Dornoch, in Sutherland, around 40 miles north of Inverness. It is directly opposite the Dornoch Cathedral, which dates from the 12th Century. The church is no longer the seat of a bishop but is still called a cathedral because it was historically the seat of the Bishop of Caithness. This hotel, in what was once the mediaeval palace of the Bishops of Caithness, is popular for those planning weddings, as well as for all those looking for a luxurious Scottish break. Dornoch Castle is notable for having its very own distillery, producing organic gin while waiting for their old style whisky to mature. There are four lovely deluxe rooms with four poster beds located in the old part of the castle, and further rooms in a more modern extension. This could be a fantastic base from which to explore the Dornoch Firth and the surrounding Sutherland area and could be a stop on your tour if you plan on undertaking the popular tourist road trip route known as the North Coast 500. A little to the north along this route you could visit another castle, Dunrobin castle and to the west is Skibo Castle, by Clashmore. 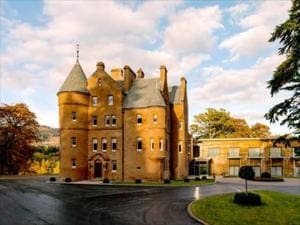 This 5 star hotel in the heart of Highland Perthshire offers luxurious hotel stays, fine dining and spa breaks in a historic castle in the Tummel Valley. In a lovely loch side location, with stunning views of Ben Vrackie, this place truly is something special. Fonab castle was built in 1892 on the banks of Loch Faskally for the Sandeman port and sherry merchants. It was later in use by Scottish Hydro Power until bought by the current owners, the Clark family, in 2002. The hotel boasts refined contemporary interiors that blend history and modernity, AA Rosette winning dining and a one-of-a kind gin bar. Each of the 42 bedrooms and suites here has been individually designed. Around the castle there are almost endless opportunities for outdoors adventure, whether you take a hike, or enjoy a tour or other activity to enjoy the surrounding natural landscape. You can explore on the water too, with a boat ride or water sports activity on nearby Loch Tay or other lochs in the vicinity. 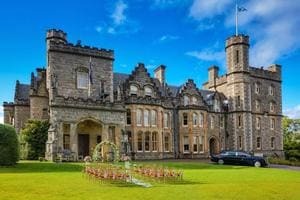 A four-star establishment, this hotel is in a country house known as Kincraig Castle, located around 25 minutes or so from Inverness in the heart of the Highlands. The hotel is set in 10 acres of stunning grounds and can be reached by means of a tree-lined drive. Home of the Clan MacKenzie for generations, this hotel is now known for its exceptional food, relaxed retreats, romantic breaks and wonderful weddings. The rooms look out over gardens and farmland towards the Cromarty Firth and the Black Isle that lies beyond, each one nicely decorated and with unique features and style. Room 16 has a unique turret, while room 23 has an antique four-poster bed. All offer a comfortable and relaxing night's stay. The AA rosette awarded restaurant offers modern Scottish dining at its best in a dining room with a roaring fire and excellent views. Wildlife watching opportunities and chances to participate in country pursuits abound in the local area, and the hotel can help you with making any arrangements. The castle is owned by keen golfers and a golf practice facility can be found in the castle grounds. There are no fewer than 20 golf courses within a 20 mile radius of the hotel, some of which are smongst the best courses in the country. 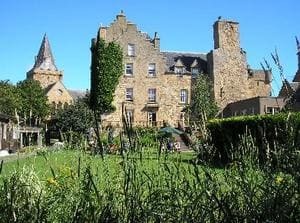 This stately castle hotel in Aberdeenshire is not only located within an historic mansion house castle which was completed in 1901 but also overlooks the ruins of an earlier 13th Century castle. 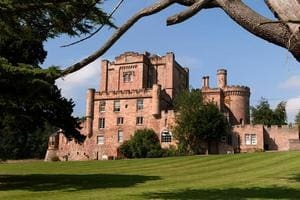 It has airy, bright rooms, some of which have four poster beds and castle ruin views. The conveniences you would expect of a top-notch modern hotel are combined here with historic charm and style. There is a pleasant lounge and bar, and a dining area where guests can enjoy local produce and an extensive wine list. Kildrummy Castle Hotel could be a perfect base from which to enjoy the delights of the Grampian Highlands. As well as exploring the 13th century ruins and Kildrummy Castle Gardens, visitors to this area can also enjoy a wealth of other local historic attractions. The hotel is also situated just to the north east of the Cairngorm's National Park, where there are plenty of natural attractions to explore and outdoors adventures in which to indulge. Whisky lovers will also be well-placed to visit some of the distilleries of the Eastern Highlands. Dalhousie Castle Hotel & Aqueous Spa is a tranquil retreat close to the capital. Here, you can stay in luxurious four-star surroundings in the oldest inhabited castle in Scotland – a truly special and magical experience. Just 8 miles from the bright lights of Edinburgh, the castle is set in an estate of 11 acres on the banks of the River Esk. It dates from the 13th Century. This was Scotland's Castle Hotel of the Year in 2016. Many satisfied guests have stayed in this towered and turreted castle over its 700 plus year history. The seat of Clan Ramsay, the castle has had many illustrious visitors, including King Edward I, Oliver Cromwell, Sir Walter Scott and Queen Victoria. The rooms are individual and idiosyncratic, with plenty of period charm, yet with everything you need to relax and unwind in style. You can enjoy wildlife walking and strolls in the the castle grounds, or even take part in some falconry or archery. Once you've spend some time enjoying the great outdoors you can also relax in the swimming pool and spa, or cosy down with a good book in the castle library. And of course, you are just a few minutes away from all of Edinburgh's many attractions. Crossbasket Castle Hotel was voted castle hotel of the year at the Scottish Hotel Awards in 2017. A charming luxury hotel is located near Glasgow, the structure dates from the 17th Century and has been lovingly and sensitively renovated, transformed into one of the best luxury hotels and event venues in the country. Each of the nine en suite bedrooms has been lovingly furnished with period features and furniture and decoration to perfectly suit the historic character of the building, while still providing modern luxury and convenience. Guests can also stay in the Gate Lodge. Legendary French chef Albert Roux and his son Michel Roux Jr provide fine dining and creative flair at the hotel's dining establishment. Golfing, hiking and fishing are just three ways to enjoy the beautiful local environment. Extensive nature walks stretch through the woodlands within the castle grounds and there is a beautiful stretch of river with amazing waterfalls. And of course, in addition to enjoying the natural world in the area, the vibrant city of Glasgow, with its enthralling architecture and cultural attractions, is just a short distance away. A five star hotel with an award-winning restaurant, Glenapp Castle could be the perfect place to indulge in a little rest and relaxation. Here you can enjoy luxury amenities amid period furnishings and interiors, and explore the attractive surroundings of gardens, forests and coastline in the area. Glenapp Castle is known not only for its charming rooms but also for its fine dining, which showcases the range of fresh local ingredients, including a wide range of produce, including some rare ingredients, grown sustainably on the castle grounds. There is a kitchen garden, including a 150 foot long greenhouse and polytunnels where much of the food served in the restaurant is grown. The castle is in Scotland's only UNESCO biosphere reserve and close to the coastline, so local produce abounds. There is plenty to keep guests occupied during their stay. Here you can enjoy a range of sporting activities on the grounds and in the surrounding area. You can also enjoy a range of activities and attractions, including castles and gardens, whisky and walks and much, much more. South Ayrshire, Dumfries and Galloway all offer exciting ways to get off the beaten track and enjoy a holiday in unspoiled surroundings. This spectacular cliff-top castle is located in Ayrshire, with views across the Firth of Clyde to the Isle of Arran. The rooms used for the country house hotel were once occupied by President, General Eisenhower. He visited here and stayed on the top floor (now used for the hotel's bedrooms) on four occasions after the Second World War. The six immaculate guest rooms are now available individually or for exclusive use, and a museum on lower floors allows you to take a step back and learn more about the castle's fascinating history, which stretches back to the 16th Century, when a tower house stood on this site. The castle was expanded dramatically in the 1770s and again in a new phase of works beginning in 1877. In addition to the guest rooms, there are also a number of other accommodation options here, including holiday cottages and camping in the country park. Guests to the castle will also find plenty more to see and do in the surrounding area. There are are delights of the coastline to explore, and a range of other attractions on the doorstep including Galloway Forest Park, one of the 'dark skies' designated areas of the UK, perfect for stargazing and astronomy. Mingary Castle is located on the breathtakingly beautiful Ardnamurchan peninsula, fairly close to Arnamurchan Point, the most westerly point in mainland Britain, and within walking distance of the ferry that will take you from Kilchoan to the Isle of Mull. A mile or so to the south east of Kilchoan village, this castle is a hidden gem. The hotel has been painstakingly renovated within the ruins of the castle, which was for 300 years the historic seat of the Clan MacIain. Each of the four unique bedroom suites has a four poster bed and en suite facilities and can accommodate a total of ten guests at any one time. Luxurious features in each of these suites ensure a comfortable, relaxed stay. The castle's restaurant serves only the freshest seasonal, local ingredients and retains a deep connection with the natural world. They forage and farm most of the food that they serve. This charming castle hotel has panoramic views of the mountains and coast. Just a few short steps will take you down to the rocky shoreline. Nearby, the coast offers many more delights, including the beach at Sanna – one of the most beautiful in Scotland. Back a short way along the Arnamurchan peninsula, you can visit the remnant's of temperate rainforest at Sunart Oak Woods, while across the water on Mull, Tobermory’s colourful harbour, beaches, castles and other attractions await. The Isle of Harris offers some of the very best scenery of the Outer Hebrides and this castle hotel offers the perfect place from which to explore its many attractions. This five-star hotel is situated on one of the finest sporting estates in Scotland, hidden behind the white gates on the scenic road to Huishinish, this is a hidden haven par excellence. Individual rooms or exclusive use are available as options for those who want a taste of this breathtaking wilderness area, and who want to stay in luxury as they explore all that the Isle of Harris has to offer. The castle was built in 1865 for Charles Murray, 7th Earl of Dunmore. It is said to be haunted by the ghost of Lady Sophie Scott, who lived here in Edwardian times. Art lovers may also be interested in the collection of paintings by William McTaggart in the castle. Guests can enjoys uninterrupted views over West Loch Tarbert and can not only enjoy the castle's lovely interior but also have direct access to a small beach and can stroll along a pathway to a sea pool and waterfall. Other viewpoints are strategically placed around the garden grounds to take advantage of the pleasing vistas before venturing out to see what else the island has to offer.